1. In Projetex Workstation, go to Workspace>>Clients>>Client. 2. 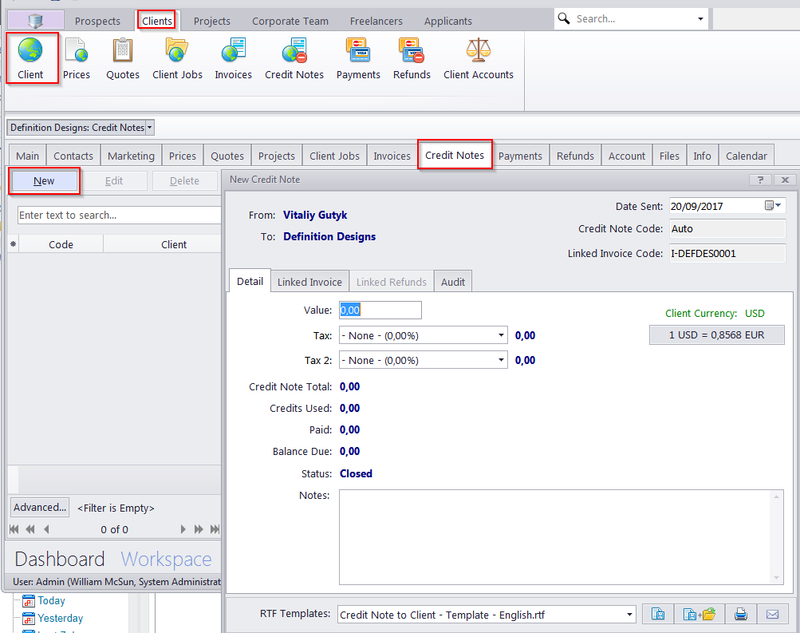 Select a client and move to the Credit Notes tab. 3. Click New and select the invoice to which the credit note will be linked (credit notes are always linked to an invoice). 4. Enter the value of the credit note, select up to two taxes which apply to it, and (optionally) some additional notes on it, such as the reason for its creation. If you want to export a document based on the Credit note, use the 'RTF Templates' function visible in the Edit window for credit notes. Projetex 3D has a built-in default template for credit notes, and new ones can be created in the "Corporate Settings>>Templates" section of the Backstage view.